Whether you’re fleeing the memory of last night’s match or just trying to drown out the sound of any football at all here are five fantastic immersive books to take your mind off things. These are repeatedly-read books that have managed to transport me to new worlds and fix their place within my favourites. In no particular order. A possible contender for my favourite book, T.H. White’s classic re-telling of the legends of King Arthur is a delightfully mischievous myth. Despite an amusing, irreverent and often anachronous narrator the representation of real humanity in the midst of legend is stunning, and this book probably breaks my heart more deeply than any other. Human foibles are delightfully exploited but a real heroism is still allowed to flourish and prosper, and one even feels deeply for the villains. Plus the magic, myth, history and plot are consistently gripping, interesting and exciting. The first book of the four, The Sword in the Stone (the basis for the Disney film) was a firm favourite when I was a child, and the discovery of three further books was marvellous! The books mature in theme and content flawlessly as the characters age, and give my favourite account of the legendary King. Another classic, and more of an easy read. Tommy and Tuppence are some of Christie lesser-known sleuths, and here at the beginning of their adventures they find themselves at a loose end. They decide to place an advertisement in the newspaper; and adventure, mystery, death, spies and subterfuge are the result. The other Tommy and Tuppence books pick the pair up in different seasons of life; we get a middle and old-aged mystery all with a bit more adventure than dear old Poirot – with just a tinge of the Famous Five. Agatha Christie is well represented in my bookshelves, but these are probably my favourite. Gaardner is most famed for Sophie’s World, the fictionalised brief tour of philosophy through the ages, and one of only two books where I have ever sincerely wondered if the characters were about to appear in front of me. His writing is powerful, simple and mesmerising. The Solitaire Mystery is my favourite of his other books (so far) though; a young boy is travelling through Europe with his father on a quest to find his mother, and finds a tiny book in a bun he is eating which tells a fantastical story that begins to interweave with his own delightfully, taking him into a bizarre world based on a pack of cards. I have lost my copy to a borrower, but have ordered a new one for a re-read. 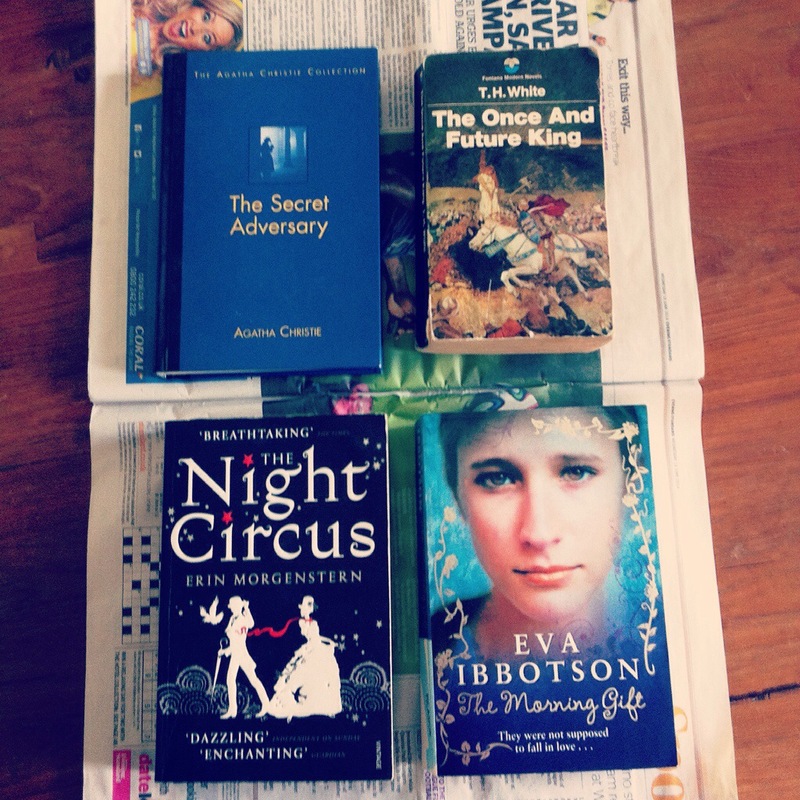 Eva Ibbotson’s books are my guilty pleasure. They mix history with fairytale, deliciously portrayed characters, marvellous settings and good writing. Here, Ruth is rescued from a Nazi occupied Vienna by Quinton Sommerville, an English scientist who marries her to get her out. The story follows her life as an emigrant in London; (based on Ibbotson’s own experience) her university career and relationship with a concert pianist, and of the love story with Quinton Somerville. It is a charming, exciting and intelligent story that I have read countless times. I love her exploration of culture and minute observations of human life that make her prose a delight to read. I have just learned that whilst the book was out of print, copies were sold for £100. This makes me pleased – it’s worth it! It is fairly rare now that I am grown that a book will completely encapsulate me, but this one did it. It charts the story of the magicians Celia and Marco, who are pitted against each other in a duel that precipitates the creation of the Circus of Dreams, an atmospheric wonderland open from dusk until dawn which is the setting for much of the book. Along with a cast of interesting and varied characters they navigate the peculiarities and realities of the challenge, which threatens to destroy them and the world they have created. The prose is filled with sensory descriptions that bring the rich and exciting world to life; to me it seems as close as literature can get to immersive theatre such as Punchdrunk (which I think I read Erin Morgenstern was influenced by) as the circus seems to build itself into a real place as you read. There we are – five of my favourites! Meanwhile, I am still in A Place of Greater Safety by Hilary Mantel. What are you reading? What did you think of these books?